I was impressed with the A5's stunning looks when it debuted for 2008, but I didn't like its 3.2-liter V-6. It lacked excitement, and even though it's the more powerful of two available engines, the coupe felt too heavy with it inside. Fellow editor Kelsey Mays reviewed the A5 Cabriolet convertible last year and found the A5's base 2.0-liter turbo maladjusted, which is strange because our staff universally loves that engine in the A4, as well as other Audis and VWs of various shapes and sizes. I discovered that the car is at its best in its most affordable, least powerful guise: the A5 2.0T. This one's just right. 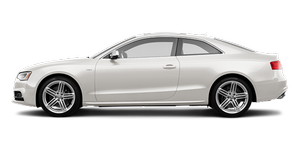 See all A5 trim levels and body styles compared here.